Scope rings have their place in the firearms industry. Some people use single piece scope mounts, while some prefer to use this type of product, which have their own advantages. Choosing a set for your rifle can and will be beneficial for your shooting sessions, both technically and economically. 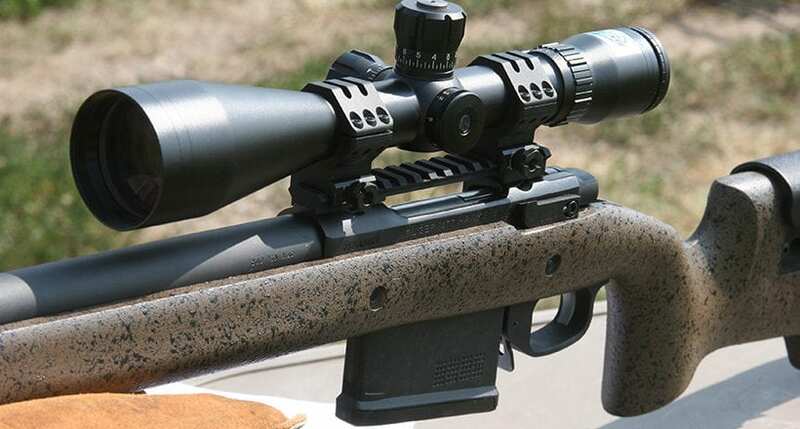 Here, we’ll learn about the design and advantages of using scope rings on your rifle. We’ll also review the best products on the market, to help you with choosing the correct one for your needs. Scope rings, as their name suggests, are splittable rings which hold the scope together, and help with mounting a scope onto a rifle. They come in a pair, where each ring is coupled on the scope tube and mounted on the receiver. They are light in weight, which makes them a better alternative to one-piece scope mounts. Additionally, they do not add to the weight of already lightweight rifles. These are able to be adjusted for the gap between each ring, which also eliminates the chances of the mount obstructing the ejection port. This feature is extremely helpful with bolt action rifles. Scope rings were designed to serve several specific purposes, which include being lightweight, ease of operation, and providing an optimum profile. When you are choosing a scope ring for your rifle, you must consider several aspects which define an ideal scope ring. Note: 30mm scope rings are not the same as one-inch scope rings (25.4mm). So make sure you have a 30mm scope tube before buying any of the scope rings reviewed in this article. These devices connect the scope to the rifle. So they obviously take a lot of pressure from the recoil and movement of the weapon. Hence, a scope ring must be durable enough to hold the scope safe and still. Rings made from metal are better than the ones made from polymer. A scope ring must provide ample space for making adjustments. It should allow you to adjust the position, tightness, and other respective factors so you can shoot comfortably and with precision. They can either be fixed or QD (quick detach). But it is always a better choice to purchase quick detach rings which can be easily removed from the weapon. Additionally, this type of product must also be versatile, so they can be interchanged among different weapons. A good scope ring must help keep the profile of your scope low. Scopes with large objectives do rise a bit high, but for scopes with mid-sized objective lenses, you want to keep it as low as possible. Based on the qualities mentioned above, we scoured the internet to find the most viable and high-quality products for every purpose. The items reviewed here have been handpicked and ordered based upon the most positive user reviews across the firearms community. Most of all, the scope rings reviewed here are fairly priced to fit the budget of every individual in the market for this product. Warne Scope Rings are among the most widely used among firearm owners. 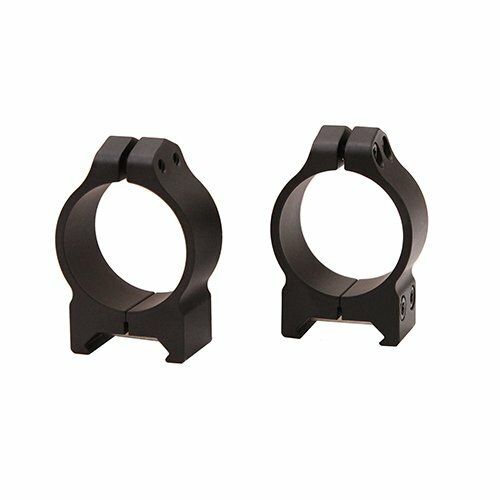 These are ideal scope rings in every aspect for small to large rifles. The rings feature a matte finish and a Torx-style socket clamp for mounting the rings and the scope securely over the rifle. The base of the rings is wide enough to maintain equilibrium under all circumstances. A square recoil key provides a maximum bearing surface to the base of these rings. The “anti-slip” design of these rings helps them resist even the heaviest recoil of rifles. Plus, the square recoil control key helps prevent any peening or swaging of these rings under any condition. The Torx-style socket cap screws allow you to easily mount and dismount the rings from your rifle. These are available in low, medium, and high variants to suit scopes of different objectives and tube diameters. These rings are made entirely from steel and are rugged enough to withstand even the most unfavorable conditions for your rifle. These rings are quite easy to set up and align, especially if you follow the instructions provided by the manufacturer. 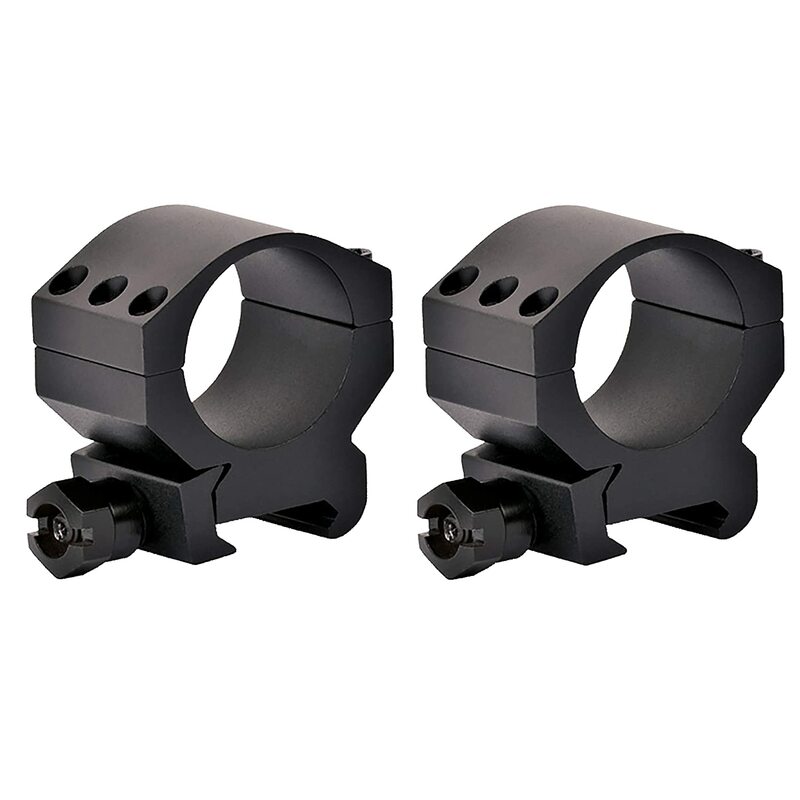 These Warne scope rings are durable, lightweight, easy to use, and fit all kinds of bases. The rings are also versatile and can be used with many rifles. Vortex is a trusted manufacturer of optic scopes, and it's not a surprise to find high-quality scope rings in their inventory. The Vortex product features an aluminum body, which makes them durable and lightweight at the same time. 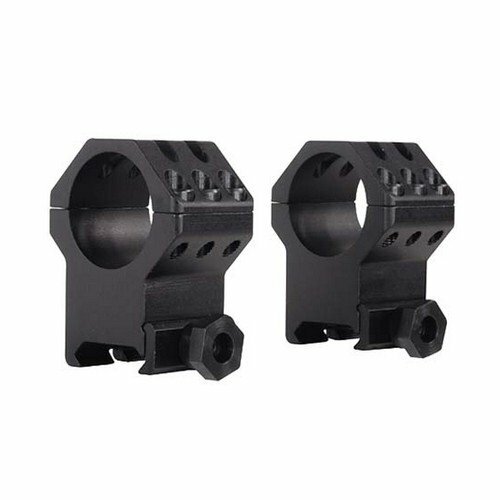 These rings have a robust six screw mounting mechanism which keeps your scopes and optic sights intact, no matter what pressure, or wiggling your rifle is subjected to. All these screws are hex screws, and the manufacturer includes a hex key in the package, to allow you to mount these rings with ease. Other than that, the rings are compatible with Weaver, and Picatinny rail systems. The side adjustment knobs allow you to mount and adjust the scope on the rail system with ease. They are intended to be used with 30 mm diameter scopes, where the scope center stays at a height of approximately 24.6 mm. This will suit most rifles. These are good for most uses, including hunting, competitions, and tactical applications. The rings generally don’t require lapping, however, the manufacturer still recommends to lap the rings when using with large rifle scopes. These rings are available in a lot of different configurations. Other than that, the price of these rings is just perfect and is a contrast to their high quality. Vortex scope rings have a set of six screws, which makes them more than reliable for mounting a scope. The rings are lightweight, inexpensive, and hold zero under all conditions. Buying these rings is definitely a no-brainer. These scope rings, as the name suggests, have been specifically designed for tactical purposes. The rings have been machined from high-grade aluminum and feature a horizontal separable design. They are easy to mount on any rail platform, thanks for the versatile and simple-to-use mounting system. The rings feature six hex screws which hold the scope firmly to resist the recoil of even large rifles like the 50 BMG. The rings have been scathed on the top to shed some extra and unnecessary weight. This helps you with carrying your rifle for longer durations. The rings are also high enough to provide good clearance for scopes with large objectives. The matte black finish blends in perfectly with the aesthetics of your rifle. Adjustable knobs on the base of the rings help with fitting them snugly on the rail system of your rifle. These rings hold zero very well and are perfect for hunting, competitions, and self-defense applications. They allow the scope to sit nice and low, meanwhile providing clearance for the tactical bolt knob. This product is entirely made in America. Plus, you have a lot of different options of height and size to choose from. 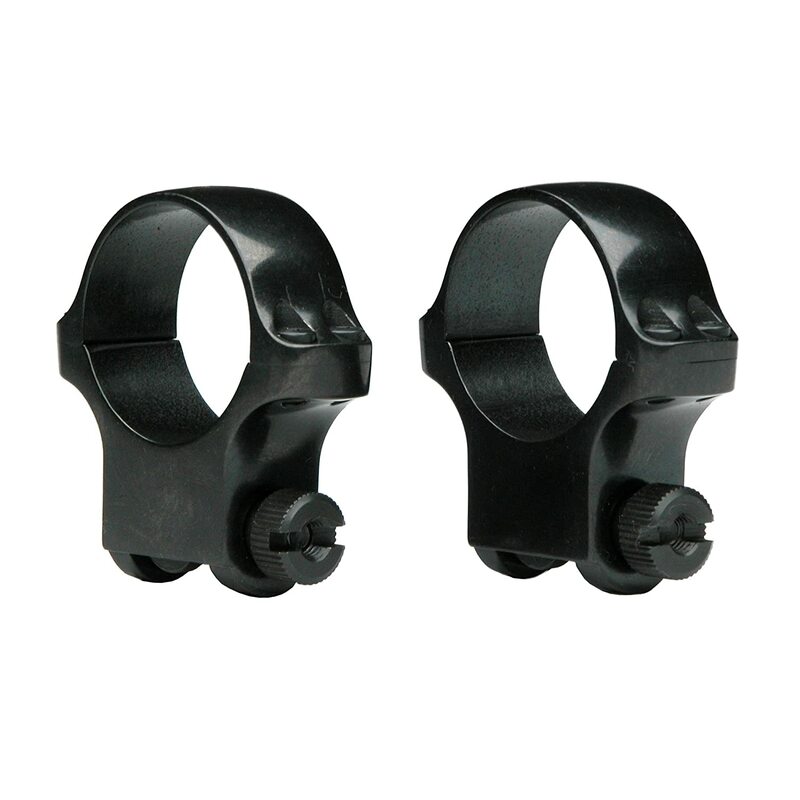 The Weaver tactical rings are durable and sturdy rings for mounting a scope. It has a horizontal separation, which allows you to switch between scopes easily without removing the mount, which is definitely a plus. Ruger has some of the most widely demanded scope rings on the market. So we decided to give them a spot on the list. These are original Ruger parts and will fit any Ruger rifle (especially the M77), along with other rifles having appropriate rails for mounting rings. The rings feature a minimalist design with less metal and more durability. The semi-rings are coupled using a couple of screws which hold the rings horizontally. Other than that, the rings can be mounted on Weaver and Picatinny rails are high enough to easily accommodate scopes with large objectives. This product is made from stainless steel and is durable enough to withstand harsh recoil. Even the aesthetics of these rings are pleasing enough to suit your rifle. The rings are easy to mount and maintain. Plus, you can also remove the scope without removing the rings from your weapon, which is definitely a plus. The rings have been aptly priced, respective to their quality. These are ideal for bolt action rifles of all calibers, which also makes them ideal for hunting applications. The Ruger Scope rings are good for hunting and competitive applications. They feature a lightweight and minimalistic design while being durable enough to resist the recoil of your weapon and also keeps your scope holding zero. The last product on our list is comparatively similar to the previous one. However, with a few minor changes in design. 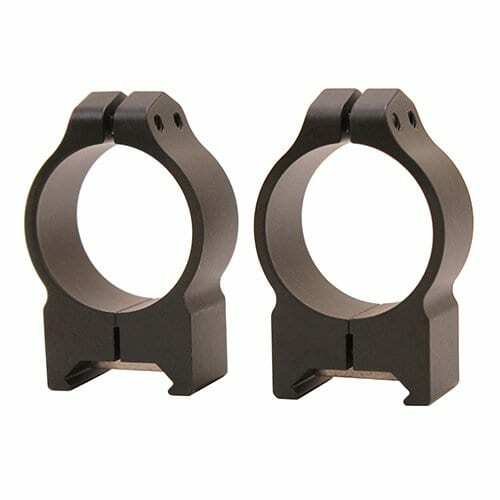 These Leupold scope rings have been specially designed for use with Ruger M77. The rings have been made using machined steel, which already speaks of its durability and quality. The rings split horizontally and have an easy to install platform, which fits most rail and mounting systems. The scope rings feature a raised platform, so you can use them with a scope having large objective lenses. These rings are by far the best ones to be used with Ruger rifles, especially the Ruger M77, since it requires a specific set of rings. The Leupold rings have a simple design and less metal which also makes them lightweight. Additionally, you can adjust the gap of your scope rings on the rifle. These scope rings also mix well with the looks of your rifle. Plus, the horizontal split design lets you interchange or remove the scope without removing the rings. The Leupold RM Ruger rings have been specifically designed for Ruger M77 rifles. These rings are lightweight and have optimum clearance to level large scopes appropriately. Scope rings can differ based upon their type. This means each can be differentiated based upon the base and the split type of the rings. Some rings split horizontally, whereas others split vertically. However, horizontally splitting rings are a better option since they do not require you to dismount the rings from the rifle. Coming to the base, rings can be suitable for different types of mounting platforms, or for each of them. These mounts include Picatinny, Weaver, Dovetail, and Leupold. Each of these mount bases has their own configuration depending upon the type for base. Like the Weaver-style scope rings have a wider base, compatible with the width of Weaver rails. Similarly, Picatinny rails are somewhat less wide than Weaver ones. Other than that, some scope rings have an adjustable base which can be tightened depending upon the width of the platform it is mounted. Furthermore, Leupold-mount bases are more reliable and sturdy compared to Weaver and Picatinny, but detaching the scope rings from them can be difficult sometimes. The most adjustable kind of scope rings has Dovetail bases, which allow you to rotate the scope 90 degrees. 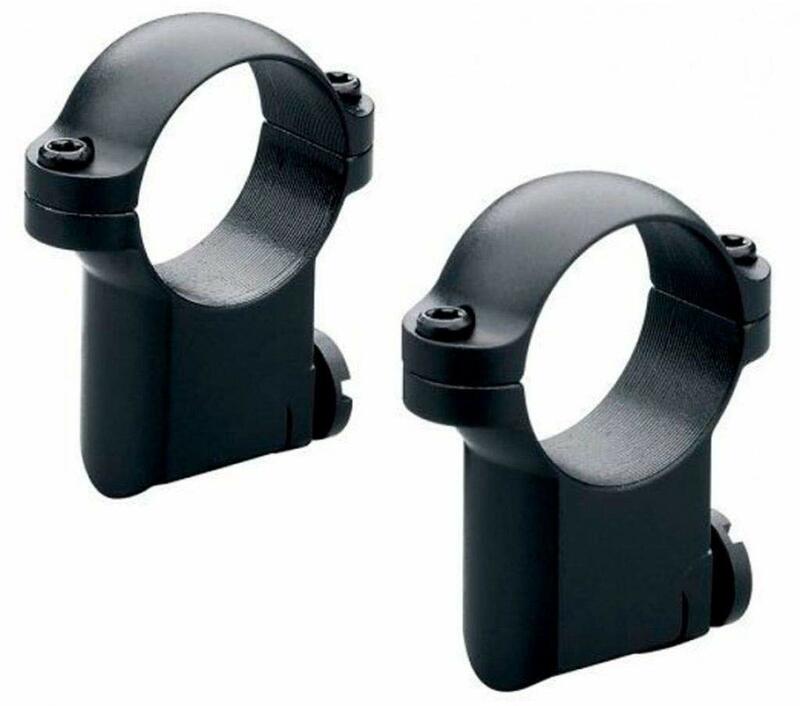 Scope rings are a lightweight and durable alternative to bulky scope mounts. These allow you to adjust the scope easily over your rifle. A good scope ring must be durable, adjustable, have a low profile, and easy to mount and remove. It is also important the choose the type of scope rings which is appropriate for your rifle and your needs.